I’ve been carrying a little book around with me and jotting notes for all the things I might want to blog about. Since today (Sunday) is a rest day for us at the resort hotel, it is a good day to catch you up on a few things. I mentioned to our Danang guide earlier in the week that we wanted to get an Áo Dài, the traditional Vietnamese dress, for Marissa. And last Thursday after leaving Hoi’s house, he suggested we go to Hội An, an historical town and now a tourist destination, and get the outfit custom tailored. On the way there we passed rice paddies along both sides of the road. A few women were tending to their rice with the occasional water buffalo. Many paddies had scarecrows to scare off birds and, for this country, that meant Áo Dài outfits on two crossed sticks with a traditional Vietnamese Nón lá hat on top. 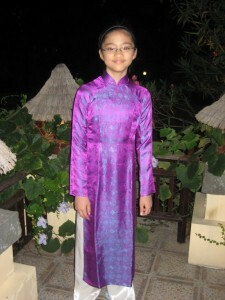 A young lady helped Marissa pick out a purple silk fabric for the top and cream fabric for the pants. I found it sweet that our saleslady was Marissa’s height too. 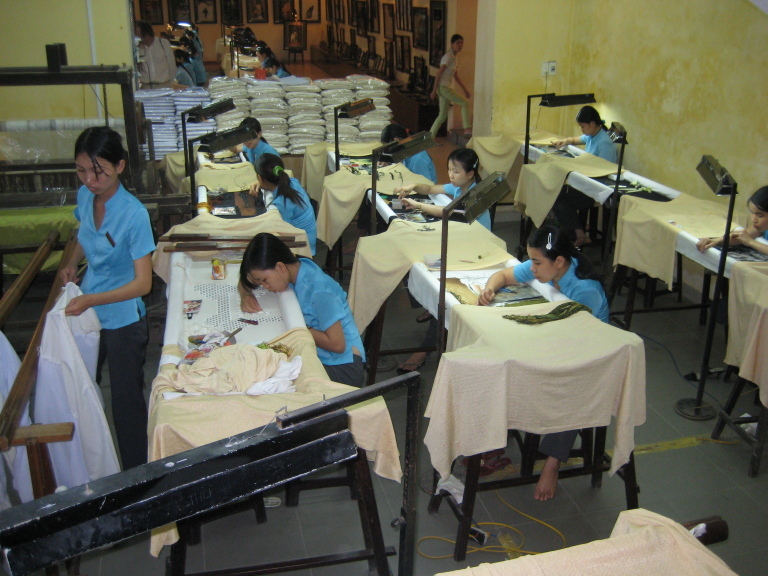 Actually, all the young Áo Dài-wearing salesladies were Marissa’s size. They measured every conceivable body part of Marissa and photographed her from a couple of different angles for her posture. The next day at 6:00pm, when we were done with our visiting Ri and Hoi, they dropped off the outfit off at the hotel. The form fitting dress fits her perfectly, which is a little sad because she’s bound to outgrow it quickly. But I suppose when she does get too big for it, we can put the dress on a stick in her uncle’s cornfield in Ohio. I had two made when were there. They don’t fit me anymore either, but they sure are pretty and I’m glad to have had them made as a memory.